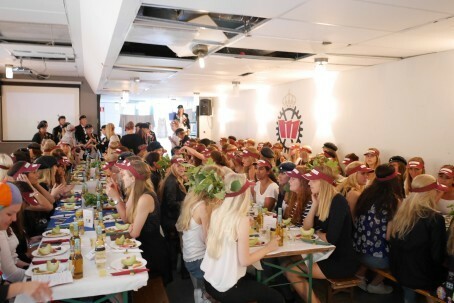 The dinner took place during the KTH Royal Institute of Technology (Stockholm) introduction weeks – one month before the start of classes on September 1st. The aim of the dinner was to discuss students’ career plans and share ideas on the place of technology in education. It was dedicated to considering engineering as a professional choice among KTH female students. Sigma Technology was honored to be the only company invited to the meeting, which was an opportunity to talk about Sigma operations and competence. Sigma Technology representatives demonstrated the initiative to engage more women to work with technology. They told the attendees of the steps the company has taken to accomplish its goal of creating a balanced environment at work, where everyone has equal opportunities regardless of their background. Johanna Simonsson, Sigma Technology consultant, shared her feelings upon studying and working at the same time in an IT company. She also assured KTH female students that an engineer holds all the cards to discover the world regardless of gender. “I find my job creative. That’s a fun thing. People mostly associate creativity with painting, design, or another type of art. For me, creativity is in programming. The whole world is open in front of an engineer, who has the freedom to choose new tools for accomplishing the goals. Programming is the way to express myself and do things I love,” pointed out Johanna.